Cryoglobulins are single or mixed immunoglobulins which precipitate when they are exposed to cold and dissolve when warmed. They may be present in small quantities in the blood of some healthy people but are most frequently associated with abnormal protein production in a variety of diseases and conditions. Precipitated cryoglobulins can slow the flow of blood and block small blood vessels. This should be contrasted with cold agglutinins, which cause agglutination of red blood cells. Cryoglobulinemia is a medical condition in which the blood contains large amounts of cryoglobulins. Several types of cryoglobulins have been identified, and the potential clinical manifestations vary by cryoglobulin type. The presence of cryoglobulins in the serum may result in a clinical syndrome of systemic inflammation (most commonly affecting the kidneys and skin) caused by cryoglobulin-containing immune complexes. Cryoglobulinemia is classically grouped into three types according to the Brouet classification. Type I is most commonly encountered in patients with a plasma cell dyscrasia such as multiple myeloma or Waldenström’s macroglobulinemia. Types II and III are strongly associated with infection by the hepatitis C virus. Type III is strongly associated with autoimmune diseases such as systemic lupus erythematosus and rheumatoid arthritis. Type I cryoglobulinemia, or simple cryoglobulinemia, is the result of a monoclonal immunoglobulin, usually immunoglobulin M (IgM) or, less frequently, immunoglobulin G (IgG), immunoglobulin A (IgA), or light chains. Types II and III cryoglobulinemia (mixed cryoglobulinemia) contain rheumatoid factors (RFs), which are usually IgM and, rarely, IgG or IgA. Types II and III cryoglobulinemia represent 80% of all cryoglobulins. Cryoglobulin test: The sample is kept at body temperature (at 37°C) during preparation. The person’s serum is then refrigerated (at 4° C) for 72 hours and examined daily (up to 7 days) for precipitates. 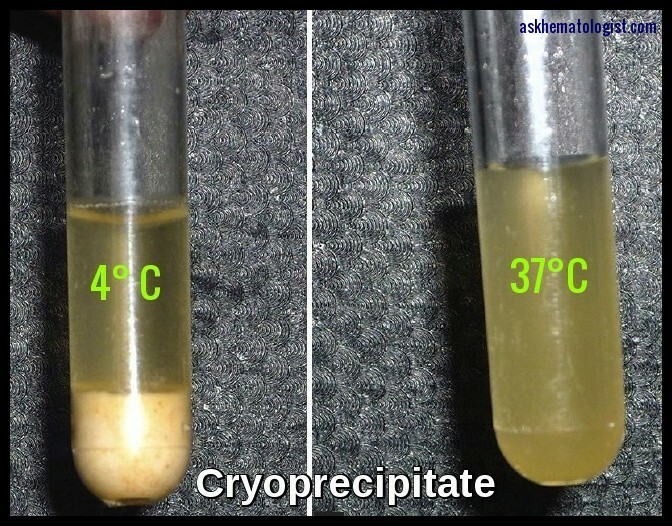 If there are any present, then the quantity is estimated and the sample is warmed to determine whether the precipitates dissolve. If they do, then cryoglobulins are present. Asymptomatic cryoglobulinemia does not require treatment. Avoidance of cold to treat mild cases. Secondary cryoglobulinemia is best managed with treatment of the underlying malignancy or associated disease. Otherwise, cryoglobulinemia is treated simply with suppression of the immune response. Hepatitis C and mild or moderate cryoglobulinemia are usually treated with standard hepatitis C treatments. Cryoglobulinemia may return back with the discontinuation of the treatment. Nonsteroidal anti-inflammatory drugs (NSAIDs) may be used in patients with arthralgia and fatigue. 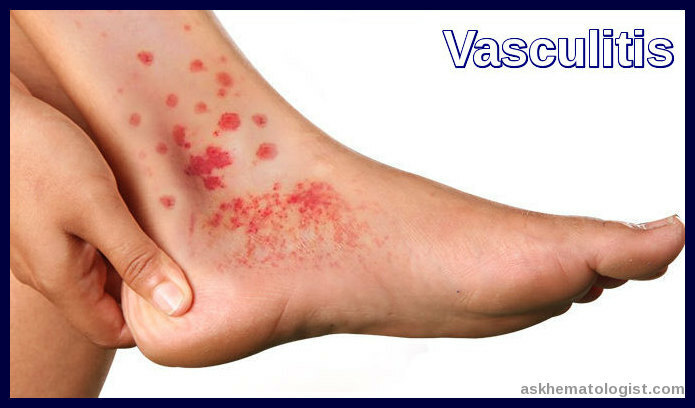 Immunosuppressive medications (eg, corticosteroid therapy and/or cyclophosphamide or azathioprine) are indicated upon evidence of organ involvement such as vasculitis, renal disease, progressive neurologic findings, or disabling skin manifestations. Plasmapheresis is indicated for severe or life-threatening complications related to in vivo cryoprecipitation or serum hyperviscosity. Concomitant use of high-dose corticosteroids and cytotoxic agents is recommended for reduction of immunoglobulin production. Rituximab therapy has been used predominantly in HCV-related mixed cryoglobulinemia refractory to or unsuitable for corticosteroids and antiviral (IFN-alfa) therapy. Rituximab therapy is reportedly well tolerated in this patient population; however, treatment has resulted in increased titers of HCV RNA of undetermined significance. Ramos-Casals M, Stone JH, Cid MC, Bosch X. The cryoglobulinaemias. Lancet. 2011 Aug 23. Adam M Tritsch, MD. 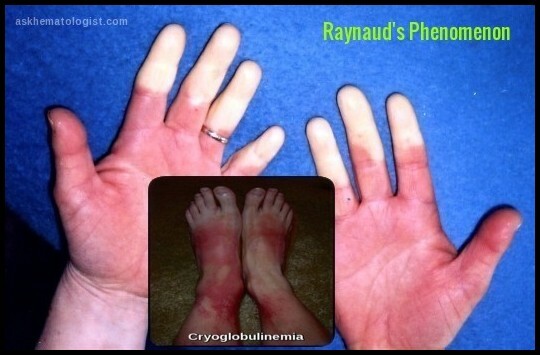 Cryoglobulinemia: Background, Pathophysiology, Epidemiology http://emedicine.medscape.com/article/329255-overview Accessed: June 2016. Brouet JC, Clauvel JP, Danon F, Klein M, Seligmann M (1974). 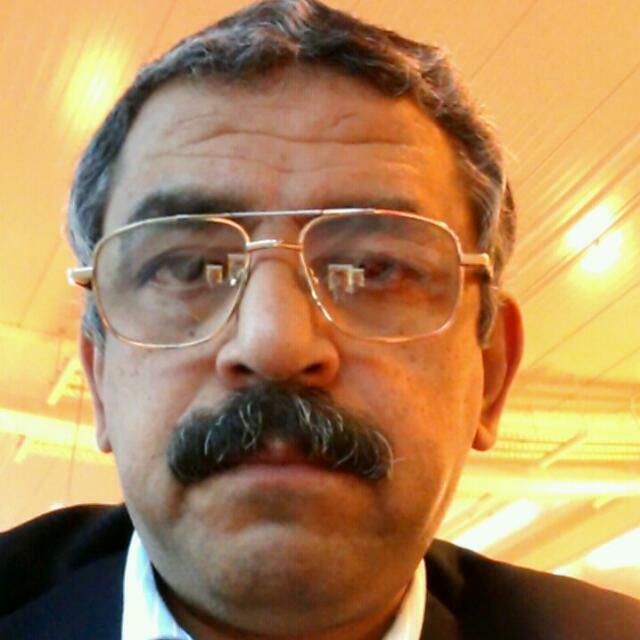 “Biologic and clinical significance of cryoglobulins. A report of 86 cases”. Am. J. Med. 57 (5): 775–88. Ferri C, Zignego AL, Pileri SA (2002). “Cryoglobulins”. J. Clin. Pathol. 55 (1): 4–13. Iannuzzella F, Vaglio A, Garini G. Management of hepatitis C virus-related mixed cryoglobulinemia. Am J Med. 2010 May. 123(5):400-8. Sansonno D, De Re V, Lauletta G, Tucci FA, Boiocchi M, Dammacco F. Monoclonal antibody treatment of mixed cryoglobulinemia resistant to interferon alpha with an anti-CD20. Blood. 2003 May 15. 101(10):3818-26. Pramod Kerkar, MD. cryoglobulinaemia: epidemiology, causes, treatment, investigations http://www.epainassist.com/blood-diseases/cryoglobulinaemia Accessed: June 2015. Cryoglobulins are single or mixed immunoglobulins which precipitate when they are exposed to cold and dissolve when warmed. Cryoglobulinemia is a medical condition in which the blood contains large amounts of cryoglobulins.